For anyone who follows personal finance, David Bach needs no introductions. He’s one of the best-selling financial writers of all time and his Finish Rich series includes eight consecutive bestsellers. With over 15 million copies of his books floating around, you’ve probably encountered one of them at some point. I’ve always been a fan of David Bach’s books, although I haven’t read them all. What I like most is how he presents the material so that anyone can put it use. While a lot of books go into detail regarding specific tools or strategies, Bach focuses on concepts and strategies. While many of the concepts may be a bit rudimentary for more advanced readers, they really drive the point home for readers who are just getting started on their personal finance journey. The Finish Rich Dictionary takes financial education to the next step by providing a comprehensive resource filled with both familiar and unfamiliar financial terms. What surprised me right from the start is the content of this book. Unlike his other works, this book is literally a dictionary. So, you probably won’t sit down and read this book from cover to cover, but it does have 1001 financial words that you need to know. The main premise is that when you know the words, you can ask better questions. I think this is a very important tip. When you’re going through the fine print of a loan, or hear someone talk about a financial topic in the news, how much do you really understand if you’re not familiar with some of the words? How can you make an informed decision if you aren’t quite sure what a certain word means? And that’s where this book can help. Unlike a traditional dictionary, you’re only going to get words that have something to do with finance. If you look up a word in a traditional dictionary, it may have multiple meanings including those outside of finance, so this book will only focus on how it applies to money. Not only that, but a lot of the words or phrases in this book won’t be in a regular dictionary. You’ll also get detailed pronunciations and other helpful information about the word. For example, take the abbreviation COLA. If you look this up in a dictionary, you’re going to see a definition that refers to a type of soft drink. The Finish Rich Dictionary points out that this stands for Cost of Living Adjustment, and is commonly used to refer to an increase in wages or benefits to keep up with inflation. And in the back of the book, there is even a collection of common finance equations and a great list of additional suggested readings on personal finance. All-in-all, I think it’s a handy little resource to keep on your desk. While you probably won’t read it cover to cover and memorize all the words, I’m sure you’ll find a lot of words you weren’t familiar with like I did. And even those words that are familiar, you may be able to expand on your understanding a bit. Knowledge is power, and the more you know, the more informed decisions you can make. 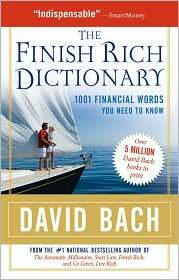 Check out The Finish Rich Dictionary at Amazon. Jim, I guess for people who might live on the computer like us, it could be just as easy to google an unfamiliar term. But there is a large segment of the population who doesn't spend as much time online, and even if they were to search, might not find exactly what they are looking for. You're right, its more of a dictionary than an actual book. Dictionaries are useful but does it beat checking things online?